Booked one night and I'm in my fourth night already! If you're looking for a quiet, chill atmosphere this is the place to be. Good breakfast and there is always hot water to make you're self a drink. They also let you store the bags if you go to machupicchu, definitely a plus! Gonzalo is a great person and if you want to know about history he is the person to go to! I'd definitely come back here. This place was amazing! The staff and owner are super friendly and the location great. I slept like a baby and had a hot shower. Also had wifi good enough to video chat in the lobby area. Weaker wifi in my room but it worked! They also had the best hostel breakfast I've seen, complete with fresh fruit. Liked it so much i stayed an extra night. Would definitely go back and highly recommend. We stayed in a private room and loved staying here. The staff is very friendly and helpful with changing the days of our reservation when we wanted to book a trek. They let us borrow rain ponchos for our trek and were in general very nice. We also heard that others in Cusco that were cold in their hostels, but we were nice and warm with a free heater and hot showers. If we ever go back to Cusco we will stay here again. A lovely, chilled out hostel in a central location. Nice social areas with sofas and lots of books. Very friendly and helpful staff. Were more than happy to store our backpacks whilst we did the 3 night Inca Trail. Comfortable beds, nice bathrooms, safe and secure. We had the best stay at Pisko and Soul! 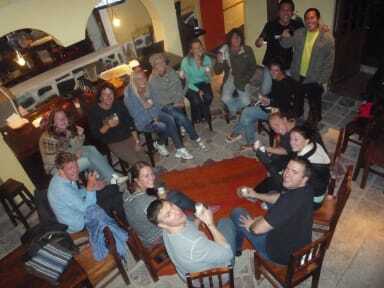 Located in the best neighborhood in Cusco, close to everything and lots of cool places. The owner was really nice, we came for 2 nights and stayed 9!! He made everything to help us and make us comfortable. The breakfast is good and shower is amazing. The place is really chill and cozy. I really recommend to stay there! If we will have the chance we definitely go back! Thank you so much! Chilled hostel, rarely any noise except for creaky floorboards. I liked the location, in a quiet part of town, but within a couple of minutes walk from bars and restaurants. The hostel seems to be on the outskirts but is only 10 mins away from the historical center. The stuff is nice and glad to help. Breakfast includes scrambled egg. Coca leaves on the reception. The shower is great with unlimited hot water and good pressure. The hostel is quiet, the atmosphere relaxed. The 4 bed room sold on the website is actually a 6 bed room with usually 5 people sleeping there, which is not cool. The wifi doesn't reach (all) the rooms. Nice hostel, very quiet which we liked. Nice staff, good location and great value for money. Not the cleanest and no kitchen are the only cons. Would recommend here. The staff was friendly. Location is good. But the bed was uncomfortable and the bedding did not seem to be clean. It took a long time to get lukewarm water in the shower. There is no hot water in the sink. Room is very bare. Was planning on staying for 4 nights and only lasted 2. The owner was quite rude during multiple conversations and overhearing his other conversations proved this point. The room I was offered had broken lockers and there was no lock on luggage storage. Garbages were not changed often in the bathrooms. Would not recommend.